Advisors who succeed in offering defined benefit and cash balance plans often partner with CPAs to identify prospects in need of new tax strategies. We’ve assembled a wealth of free materials and training to support you as you talk to CPAs, gather referrals from them and help cultivate them as a lead source. Dedicated Defined Benefit Services provides ongoing sales support and administrative services. We are independent and do not charge asset-based fees. We are here to help. 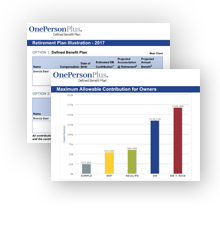 OnePersonPlus is a powerful retirement plan that allows clients the largest yearly retirement contributions — averaging $120,000 in 2018 — while saving huge amounts in taxes. This unique program is for owner-only businesses, and individuals with self-employment income. Depending on the situation, business owners may be able to save over $2.6 million for retirement in just 10 years. Download this PDF to email to your CPA contacts. You’ve identified one or more CPAs who may have clients who are good candidates. 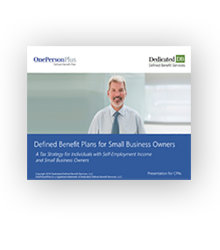 Use this “OnePersonPlus Defined Benefit” PowerPoint to present to CPAs. Take the time now to personalize this presentation and set up time to meet with CPAs. You’ll get a personalized estimate in a client-ready proposal that you can save as a pdf. It’s free and quick to run. Tell the CPAs you approach you’d be happy to run a complete proposal for their client. You’ll quickly have a professional proposal to deliver. 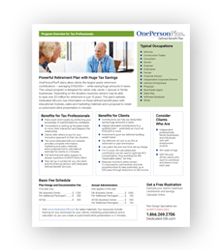 The tax savings will get them thinking about the right clients for this plan, and you as the go-to advisor to set it up. Learn how a financial advisor has successfully partnered with CPAs to help clients save on taxes.